Thousands of pounds have already been raised in pre-orders for the fundraising book featuring Tony Walsh’s vigil poem This is the Place. The book, which will be uniquely illustrated by 61 creatives, goes on sale later this year and all profits will go to three Manchester-based charities. Amazon are backing the book’s publication, not only by listing it for pre-sale but also assisting with the fulfilment of orders. Each line of the poem will be accompanied by a design, illustration or photograph to illuminate its message. 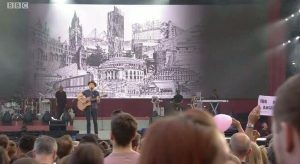 One of the artists will be Marc Gallanders, 26, from Worseley, whose cityscape of Manchester (above) was used as a backdrop for Niall Horan’s ‘This Town’ performance at the One Love Manchester benefit concert. The proceeds from the book will be split evenly across three charities including Forever Manchester, We Love MCR Emergency Fund and The Greater Manchester Mayor’s Homelessness Fund. James Torry from the team leading the project, said “We’ve been overwhelmed by the response. Creatives from all over Manchester have offered to contribute.